Jaybird X2 headphone is specifically designed for a great music experience. The headphone comes with premium Bluetooth audio sound and that makes this a great pick for your outdoor activities. With its unique wireless design, it appeals to almost all the sports lovers or people who use headphones for workouts. Though it does not have the noise-canceling feature, still it blocks the sounds and noises in the ambiance and that is great. The sound of the headphone is good if you compare it with other headphone models. The overall audio performance of the headphone is great. In the year 2012, Jaybird had introduced BluebudsX. As compared to this version, Jaybird X2 headphone has come a long way. There is no sound leak in this model and the audio quality is superior. The only thing that sets it apart from other wireless headphones is, it can’t be customized. The look of the headphone is stylish and sleek. The fit is also great and there is no complaints about the pressure or connectivity as such. It’s actually comfortable if you need to wear it for the whole day. The closed back look adds to the clarity of Jaybird X2 headphone. 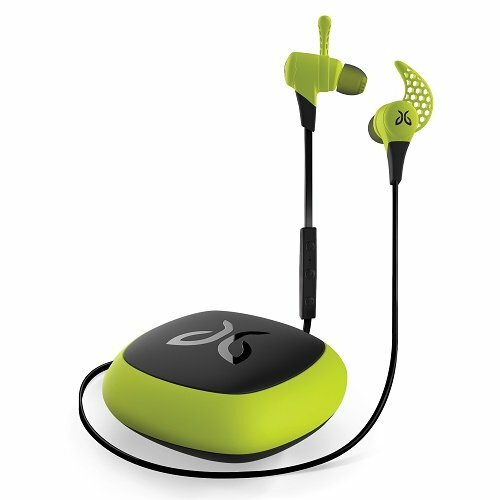 Jaybird X2 headphone is for all the sports people or people who are heavily into outdoor activities. Also, if you practice heavy workouts then you must buy this classy headphone. It’s completely sweat-free so you actually don’t have to worry about your ease whilst enjoying your music session. It is indeed a great piece if you are into sports and workouts, you won’t get disappointed. If you are a music lover, then you can buy the headphone without any hesitation. The audio quality is not only superb but it also features a deep bass base and that makes all the difference in sound. You can enjoy your playlist on the go even while traveling as it has a passive noise isolation feature. It lets you enjoy your music on the go. The headphone is not that good for your gaming needs. Though the sound quality of the headphone is good, it does not resonate that much. It won’t give you that solid sound effect if you need to use it for gaming. It is good if you to want to use it for traveling purpose. It does not completely block the sound but it gives you a good audio input quality. You can also use it for your incoming calls. There are many great features of Jaybird X2 headphone; let us look at some of the key features. The headphone has premium Bluetooth Audio support for great sound. It lets you enjoy skip-free music outdoors without any problem. Jaybird X2 headphone lets you enjoy eight hours of music without any interruption. You can also attend to all the calls with remote control support. The headphone offers Secure Over the ear option. Its Under-Ear Fit option is also cool and comfortable to wear it on a daily basis. Jaybird X2 headphone offers sweat free warranty; it only means that you can use the headphone for your strenuous workouts and sports activity. There won’t be any problem if you wear the headphone for hours at a stretch. The headphone has three different sets of ear fins that steady the fit against the ear so that you feel more comfortable. Jaybird X2 headphone gives you 8 hours of battery life, which means you can enjoy music on the go without the need to charge it time and again. But this also depends on the use. If your use is more, then the battery can drain sooner. The headphone comes with USB charging cable so you can charge the headphone on the go. The micro USB end of the headphone connects to the earpiece near the control. A snap-shut cover when not charging protects the port of the charger and that is a great feature. Jaybird X2 headphone has a silicone ear tip that takes care of comfort. You will not feel any kind of pressure on your ears with this feature. Jaybird X2 headphone has signal plus feature that allows you to hear skip-free music outdoors without any stress. It also has a soft premium Bluetooth audio for a great sound and music experience. The headphone features a wide panel and that makes it different from other headphones that are available in the wireless base. The secured fit feature gives you complete rest so you can easily wear the headphones throughout the day. The sports foam ear tips provide with complete comfort. Jaybird X2 headphone is an in-ear fit headphone. You can’t expect complete comfort in these kinds of headphones. But, you won’t be disappointed either. In-ear fit headphones are not so comfortable for the longer duration. This is not the case with Jaybird X2 headphone. You can wear the headphone for hours with slight pressure on your ears. The best part is, the headphone is light in weight so you don’t have to worry about carrying the headphones too. As the headphone is made from memory foam, you can expect a good grip on your ears too. It’s good for the price on offer. Jaybird X2 headphone has a passive noise isolation feature. This feature helps to block the sound from the environment when you hear your audio. The headphone creates a tight seal effect so that there is no pressure on the ears. You can hear your music or the audio even with loud noise around. As the frequency of the headphone depends on the environment, unlike noise canceling feature this won’t completely block the sound. Still, you can expect good noise isolation if you need to hear your music in loud settings. In fact, the noise isolation offers a great performance. Jaybird X2 headphone is not only stylish in looks but also well crafted in overall performance. The headphone is light in weight and awesome for your workouts or sports activities. The headphone can fit in your pocket so you can easily carry the headphone along with you. If you feel comfortable with an ear in design, then you will surely love this headphone. The side buttons are small and that is the only drawback of this headphone design. The build quality is pretty robust and sturdy, so you can also use the headphone for your rough use. The connectivity of the headphone is great. Jaybird X2 headphone is a decent sounding headphone. It offers good bass effect and that makes the sound quite clear even if you hear the headphone outdoors. However, the sound can be a little cluttered on the mid-range or high range. The low range sound of the headphone is great. The headphone suits every genre of music so you don’t have to worry on that part. You will be able to enjoy every sound with a great frequency base. The soundstage feature is missing and that is also a drawback with this headphone. You can expect a good audio support with this. The battery life of Jaybird X2 headphone is not that great as it offers 8 hours of super capacity battery. If you need to use the headphone for longer use, then you will need to charge the battery. But, being wireless the battery performance of the headphone is actually good. The headphone also lets you make calls for a longer duration with remote support. The use of buttons is again a great feature. The headphone comes with a charging cable so you don’t have to worry about the charging part. Portable USB charger is also available with the headphone. The leakage performance is great. It offers a stable in-ear fit. The passive noise isolation feature is good. Battery life is a problem. Is slightly higher in price. The fit can be a problem. You need a separate case for carrying. Jaybird X2 headphone is a great choice for outdoors. The sweat proof feature of the headphone indeed works. It’s ideal for your long gym workouts as well. The stable wireless design of the headphone is also great. There is no problem with connectivity and that makes it different from other headphones that are available at a similar price. Look wise its stylish so you can also flaunt your headphone while traveling. Jaybird X2 headphone is great for the features it offers. Performance wise it’s not too good but not too bad either. It is quite popular because of its design and its in-ear style. The durability and comfort of the headphone are also good. The battery life is not that great and it could have been better with this price. The high and low sounds of the headphone are good. The remote functionality and connectivity of the headphone are better as compared to other wireless headphones that are available. Overall it does give you value for your money.